Recombinant monoclonal antibody to c-myc epitope tag. Manufactured using AbAb’s Recombinant Platform with variable regions (i.e. specificity) from the hybridoma 9E10. Immunogen: A synthetic peptide corresponding to aa 408-439 from C-terminus of human c-myc. Specificity: Epitope sequence, EQKLISEEDL, located in aa 410-419 of human c-myc protein. Note on publication: Describes the making of the antibody, shows it recognises a 62kDa c-myc protein in c-myc overexpressing cell lines (Western blot). AB00100-1.0 (2 µg/ml) staining of HEK293 spiked (A) and unspiked (B) with 5ng multitag protein (35 µg protein in RIPA buffer). Lane C contains 25 ng purified multitag protein as positive control. Primary incubation was 1 hour. Detected by chemiluminescence. Left Panel: Ab00100-1.0 (2 µg/ml) staining of HEK293 spiked (A) and unspiked (B) with 5 ng multitag protein (35 µg protein in RIPA buffer). Lane C contains 25 ng purified multitag protein as positive control. 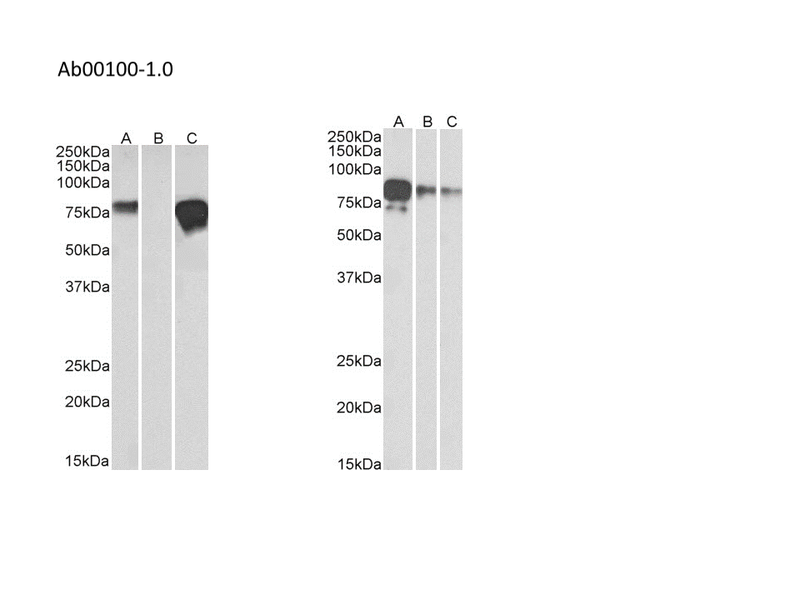 Right Panel: Ab00100-1.0 (1 µg/ml) staining of Multitag protein at 25 ng (A), 10 ng (B) and 5 ng (C) amounts. For both, primary incubation was 1 hour. Detected by chemiluminescence. 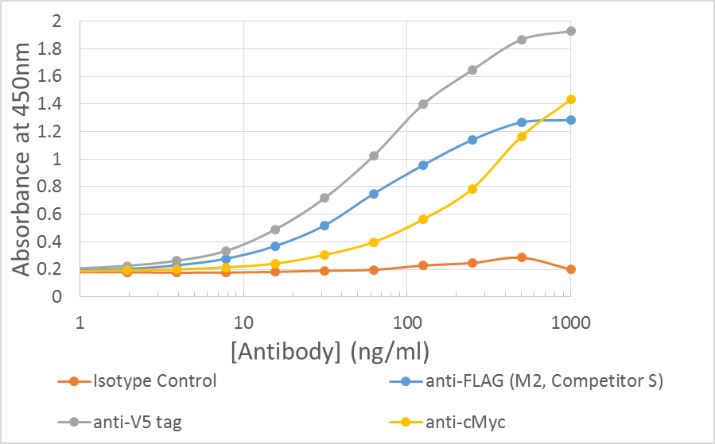 ELISA of anti-epitope tag antibodies. ELISA of anti-epitope tag antibodies on multi-tag protein Plate coated with 5ug/ml of Multitag protein (Pr00106, Absolute Antibody). 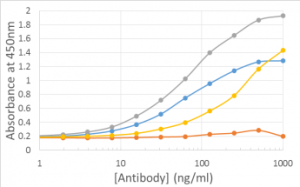 Primary antibody loaded at 1000ng/ml in first well and an 11 point serial dilution performed in duplicate for each antibody with last well left blank. Signal detection was performed using HRP-conjugated goat anti-mouse (AbD Serotec, 0300-0108P).